Gourmet food was not a known quantity in the 1900’s. At least not in the plains of Oklahomaor anywhere in the Midwest for that matter. Somewhere between 2000 and today – 2013 – it arrived on our plates in fancy restaurants, appeared on live television chef show-downs, and filled magazine stands. I’d have to research the exact progression, but Julia Childs didn’t hit mainstream households until Emeril and Cupcake Wars took center stage. All I know is it didn’t show up in my home until recently. And what I cook still doesn’t qualify. I get recipes from Cooking Light and an occasional newspaper article, and I call it gourmet. I’m still shocked when I open my pantry and find it lined with coconut milk, EVOO, gourmet wine vinegars, sea salt crystals, beans of every variety, and herbs I still can’t pronounce. I have hummus in the refrigerator and pita chips on the shelf. I eat pomegranates and kumquats. I know how to blend, dice, sauté and puree. I still have not tried infusion – whatever the heck that is. Maybe because my daddy and his brothers always quartered a cow each fall and had it butchered into hamburger, steaks, and rump roasts, we lived on beef. Fried, broiled, baked. Grills did not exist. The dinner plate was complete with potatoes (boiled and mashed), vegetables (usually canned green beans), bread slices (soft white packaged), and a glass of milk. Dessert was probably a layer cake (chocolate) that my mother had spent the afternoon baking and frosting (packaged cake mix, home-made frosting). And that was it – Monday through Saturday. Occasionally we celebrated Saturday night eating out at the 12 for a dollar hamburger stand. Juicy (make that greasy) and topped with fried onions. That was gourmet. Sundays were special. First of all, as Southern Baptists we lived at church that day. Sunday school followed by church service; back at five o’clock for choir practice, Bible study, and evening church service. So that was the day my dad cooked. It was always fried chicken – sometimes purchased at the grocery store, but for several years, head-severed hens from our back yard chicken coop. Dad’s fried chicken was world famous in our house. Mother’s cooking couldn’t touch it. He’d come home from church, remove his tie and good dress shirt, slide one of mother’s aprons over his head and get out the cutting board, large can of Crisco and a mound of salt and peppered white flour. The splatter of grease when he dropped the breaded chicken pieces into the three inches of melted Crisco could be heard from the street. 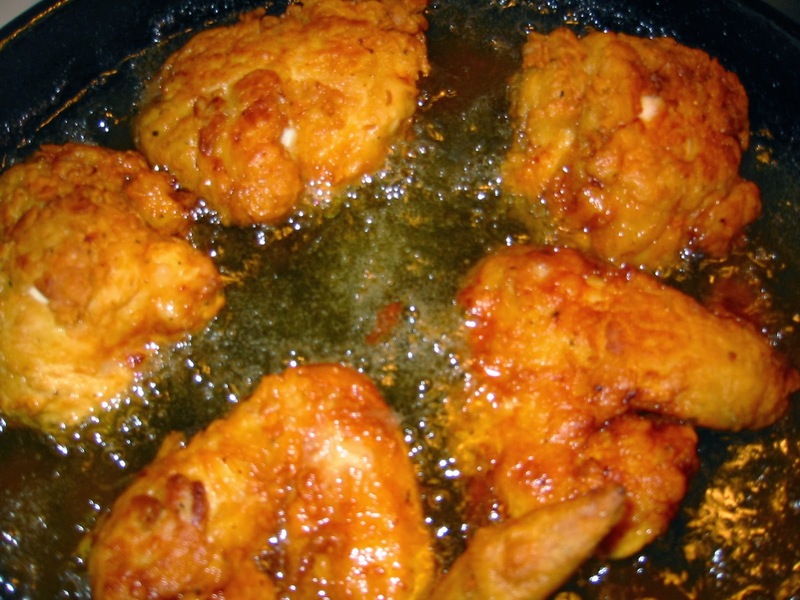 The hotter the oil, the crispier the chicken crust; then down to a slow simmer once the lid was placed onto the cast iron skillet to finish cooking. The smell wafted through the house and into the back yard where I was usually playing with my good friend Sue-Sue. On Sundays we did not have to be called to the table more than once. Dad standing at the stove, looking silly in mom’s apron, tongs in hand to turn the crackling chicken before it burned. It became a family tradition and a wonderful memory. I sometimes wonder what memories my children will have of me in the kitchen. I raised them on pot roast and fried chicken as well. And my mom’s Texas Sheet Cake and chocolate chip cookies. And each July 4th, my dad’s hand cranked home-made ice cream. My daughter was the first (and probably the only) gourmet in the family. She has taught me the ingredients and the terms. The outcome is usually edible though it never looks like the picture. And often I have to substitute some strange thing I’ve never heard of with something I happen to have. But I figure if I follow the recipe 90% that counts. My son now has us on a GMO free diet so it’s becoming more complicated. Now I not only have to purchase expensive ingredients from the gourmet aisles at the grocery store, I have to purchase grass fed beef, organic vegetables and fruits, and local eggs and poultry. I may have to take out a loan to prepare Thanksgiving dinner this year. Hmm. I haven’t fried chicken in ages. Maybe I’ll make it tonight in honor of dad. This entry was posted in Uncategorized on October 24, 2013 by cwesala.